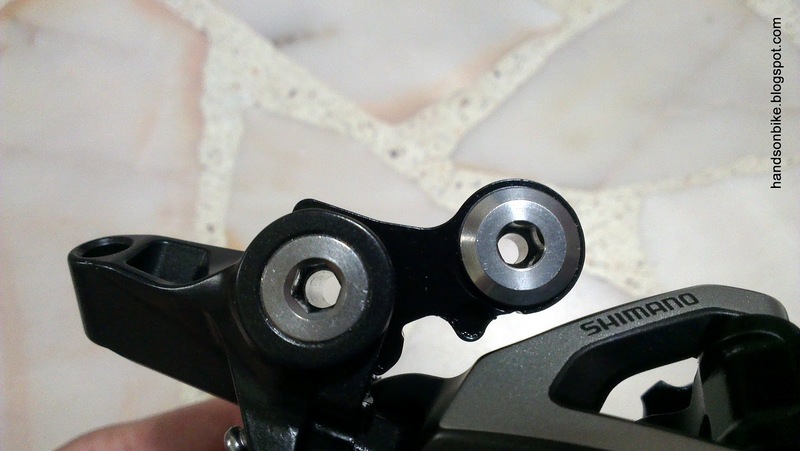 Recently, Shimano came out with a new RD mounting standard called "Direct Mount". 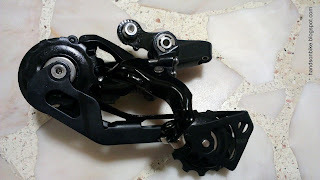 What it does is to free up space around the rear dropout area, allowing frame designers more leeway to design a larger thru-axle or to play around with the frame geometry. 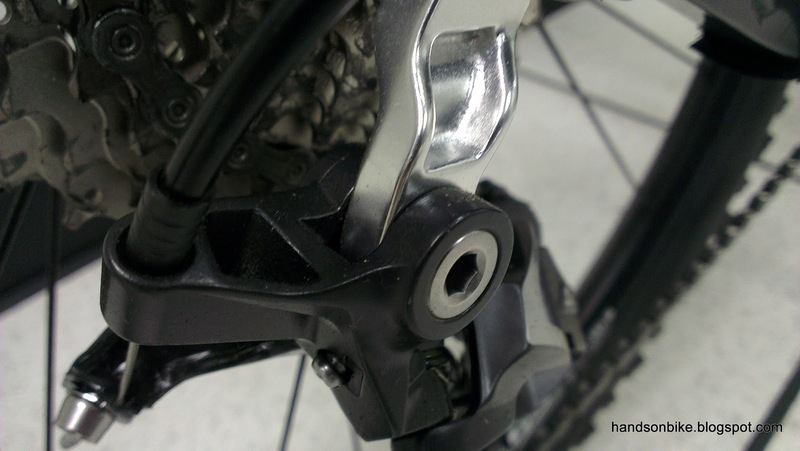 As a bonus, this direct mount design also makes it easier to remove the rear wheel, as there is a clearer path for the wheel axle to exit the frame dropout. As you can see from the picture above, the Direct Mount RD hanger sticks out behind the frame dropout, making it easier to remove the rear wheel without the hanger or RD getting in the way. The Polygon Cozmic CX 3.0 MTB that I got a couple of months ago came with this type of RD mount. It was equipped with a Shimano SLX M670 Shadow RD with Direct Mount. This gave me a chance to learn more about this type of RD mounting. 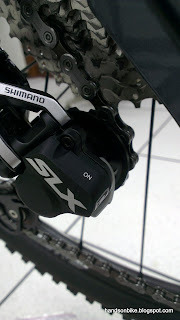 The SLX RD that came with the bike is the new SLX M670 RD, but it is not the Shadow Plus version with the clutch. To learn more about the Shadow Plus technology, click here. As for myself, I was also quite curious about the Shadow Plus technology, having heard about it but not had the chance to try it out. 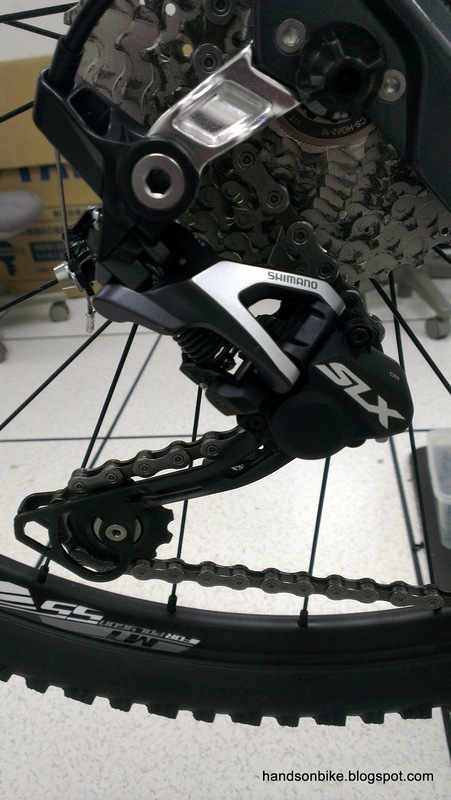 The Shadow Plus RD was first introduced at the XTR level about 2 years ago, but its price tag made it prohibitively expensive for most people. 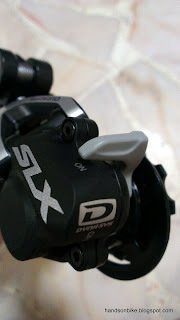 Luckily for us consumers, the Shadow Plus technology has been trickling down the product lineup of Shimano, and for 2013, SLX also has the Shadow Plus version of the RD! 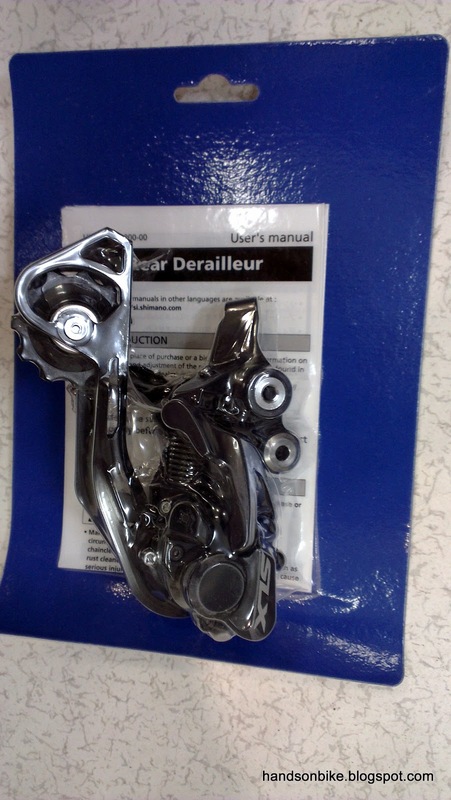 In fact, it will also be available for Deore in 2014, making it affordable for a much larger market. The new SLX RD comes with a standard RD mounting, but with an option to convert to Direct Mount. 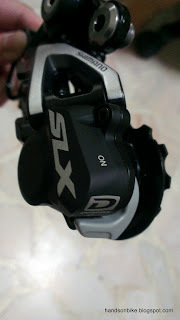 Since I also wanted to try out the Shadow Plus feature, I decided to buy a SLX Shadow Plus RD, so that besides trying out Shadow Plus, I can also learn to convert the RD from standard mounting to Direct Mount. Ordered from CRC. Came in a special shrink-wrapped packaging. Guess it was repackaged from OEM stocks. 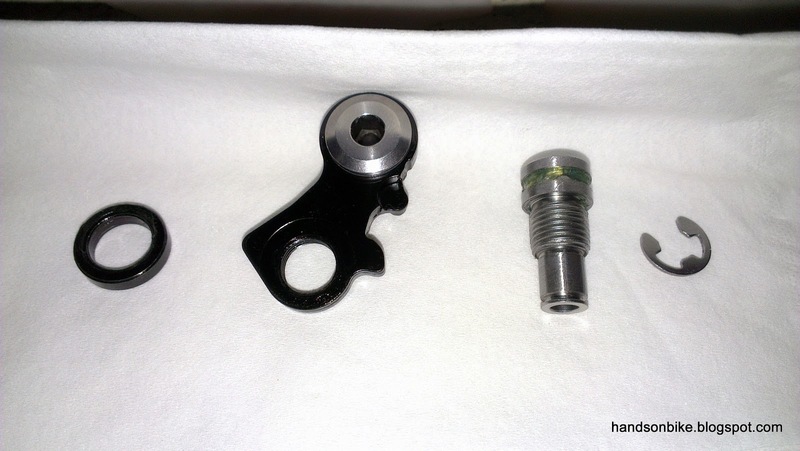 Comes with the standard RD mounting as seen from the mounting bolt at the top of the RD. Rear view of the SLX RD-M675. Switch set to ON position! One way clutch activated. 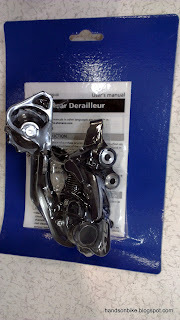 Now, in order to mount the new SLX RD on my Direct Mount dropout, I will need to convert the mounting on the RD, from the standard mounting to the new Direct Mount. Without removing anything, this RD can be bolted onto a standard RD hanger, but not a Direct Mount RD hanger. To convert to Direct Mount, the extra link plate shown needs to be removed. 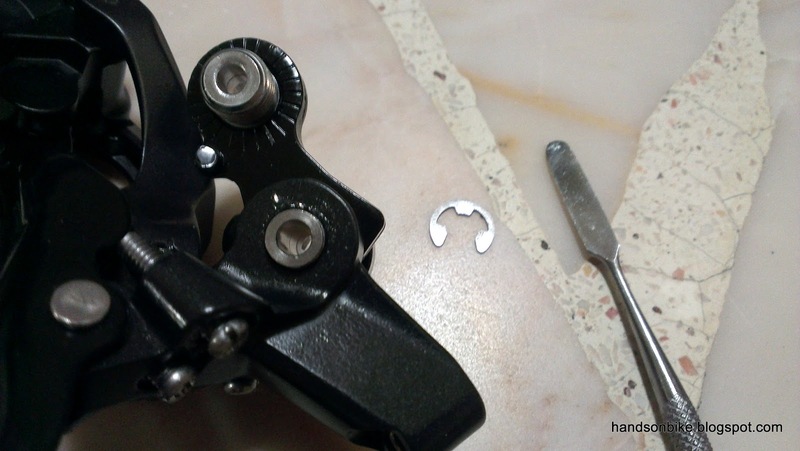 First, use a flat tool to pry open the E-ring. Surround the E-ring with your hand so that the E-ring doesn't spring away and disappear. 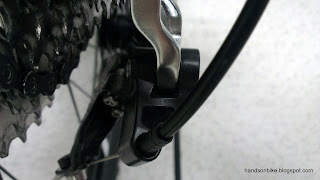 Next, unscrew the bolt shown above with an M5 Allen key. 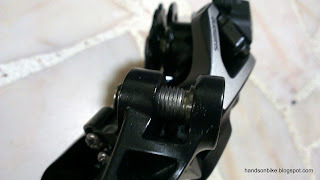 Note that this bolt is VERY tight! With the bolt unscrewed but not removed yet. From left to right: Spacer, link plate, bolt, E-ring. May differ between different RD models. With the extra link plate removed, this is how it looks like. Finally, put back the bolt that was just removed. The RD has been converted into a Direct Mount RD! 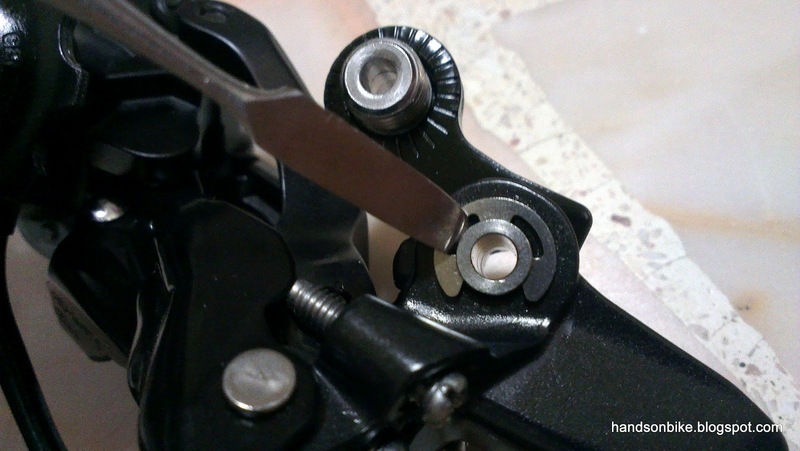 When installing, first remove the bolt from the RD. Slide the RD onto the Direct Mount RD hanger as shown. 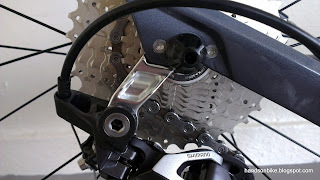 Once the holes are aligned, put back the bolt and screw it onto the RD hanger as per normal. Ta-Da! New SLX Shadow Plus RD with Direct Mount. Looks sweet! Shadow Plus switch on the RD. Currently in OFF mode. I have not had the chance to bring the bike out onto the trails, to try out the Shadow Plus feature. Will write another post about the Shadow Plus feature after some testing. Also, in the next writeup I will also show how to adjust the clutch mechanism inside the Shadow Plus RD. Watch this space! 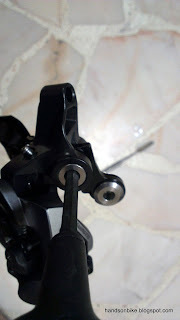 My question is this can I mount it to my Dahon MU P8 without removing the hanger on it in place of Neos RD? 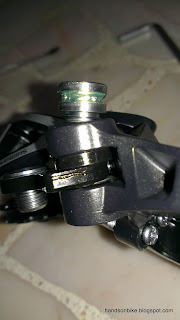 you can mount it on the Dahon MuP8, but not at the Neos RD mounting point. First you will need to swap out the stock dropout (no hanger) to a dropout with the RD hanger (official Dahon RD hanger for Mu frames). 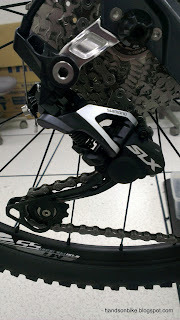 Then you can mount this any standard MTB or road RD to the hanger. 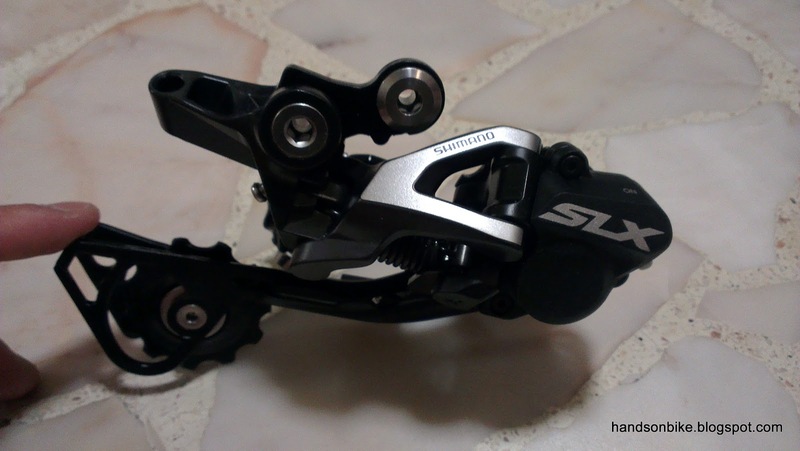 Does the shadow derailleur has lower ground clearance compared to the normal? 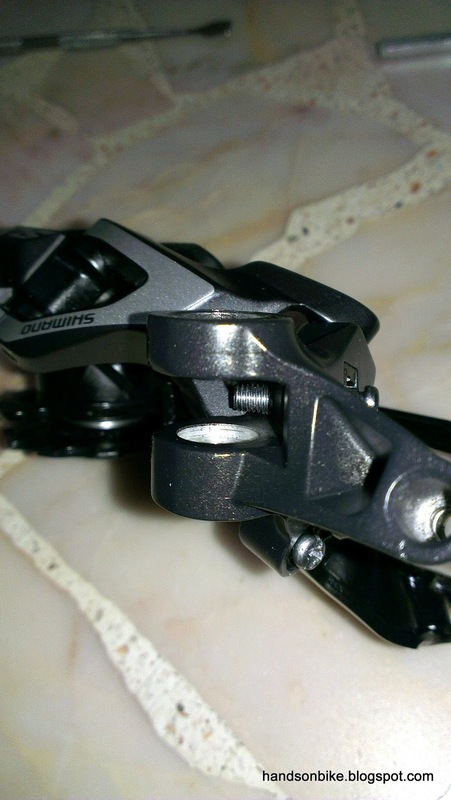 Also when you are at highest gear, does the derailleur still stick closer to the frame? Thanks! Comparing shadow rd to non shadow rd, the ground clearance is similar because the rd cage length is the same. 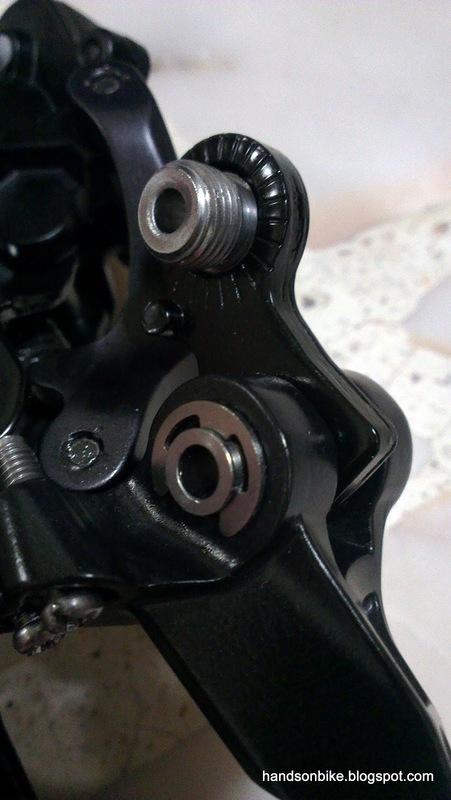 When at highest gear, the rd does not stick out as far and is thus less prone to damage.